Looking for the perfect gift for that total and utter geek on your holiday shopping list? 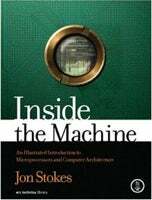 Ars Technica's co-founder and Senior CPU Editor Jon Stokes's book has just come out: Inside the Machine: An Illustrated Introduction to Computer Architecture and Computing Fundamentals . Pretty geeky material, certainly, but Stokes knows his stuff, and, better yet, actually makes a lot of it interesting, even to lesser geeks like myself. I've enjoyed a number of his CPU pieces on Ars, dense as they are. Inside the Machine covers processors from the Intel and PowerPC families from the original Pentium and PowerPC 601 through the brand-spanking new Core 2 Duo/Solo architectures. He starts with the fundamentals of processor operation, then moves on to specific architectures. It's all a gigantic festival of the geektastic , but there are plenty of us who would crack this sucker open on Christmas morning and not stop reading until dinner time, pausing only for the occasional devouring of chocolate. Two hundred fifty copies, signed personally by Jon (and including a lot of special features), are available at Ars Technica's store for $50, or on Amazon for just over $30.